Complete renovation in this amazing 3 story townhouse with fantastic finishes throughout! 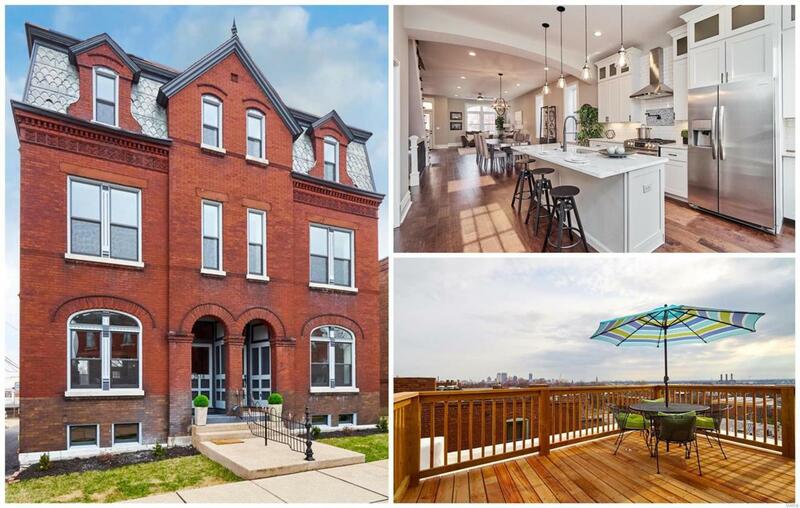 4 beds, 3.5 baths, 2 car garage, 10ft ceilings, 3000sf & AMAZING rooftop deck with arch view! Open floor plan with gorgeous hardwood floors, original exposed brick wall, custom arch to must-see kitchen with marble countertops, center island, stainless appliances, plus main floor bath! 2nd floor has a gorgeous master suite with huge walk-in dual shower, soaking tub, double marble vanity, huge walk-in closet with connection to 2nd floor laundry. Additional bed & full bath on 2nd floor plus 3rd floor has 2 more beds, another full bath and family room with wet bar & wine fridge and stairs leading to the most amazing private roof top deck you just have to see! Completely refinished top to bottom including TPO roof, zoned HVAC, all new plumbing & electric, double thermal windows throughout, main floor deck, privacy fenced yard & 2 car garage. Dont delay, this wont last! Listing provided courtesy of Byrne & Assoc Real Estate. Listing information © 2019 Mid America Regional Information Systems, Inc.